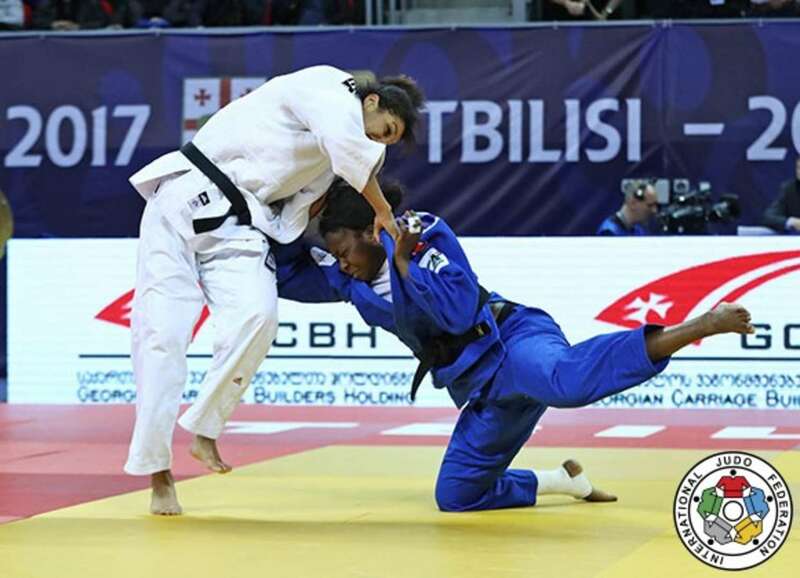 While the tatami of the Tbilisi Grand Prix are ​​still shaking with the last ippon scored by the champions of the day, it is time to have a look back at a tournament that has not only its place in history but also in the future of international judo. After an Olympic cycle that ended with fireworks in Rio last summer, the beginning of 2017 marks an important transition phase for the future of judo. A new cycle begins, new refereeing rules are currently in the test phase and each competition offers its share of confrontations between old and new generation. There is only logic here. Yet the emotion of winning a tournament on the IJF World Judo Tour and fighting in this mythical city of Tbilisi are an important part of the analysis. 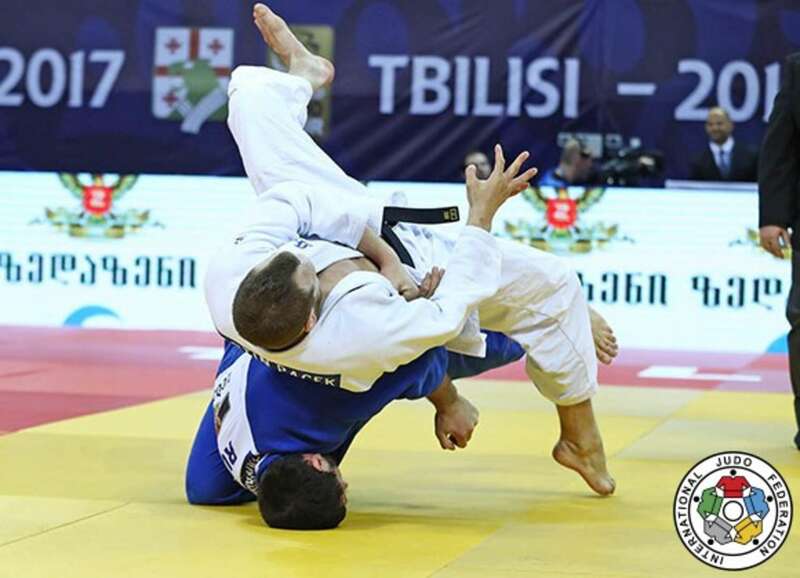 "The Tbilisi Grand Prix was particularly interesting this year,“ said Mr. Vladimir Barta, IJF Head Sport Director, and Mr. Daniel Lascau, IJF Sport Director, before adding: "We saw new faces. It is an undeniable fact that a new generation of competitors is being born in front of our eyes. But it is also interesting to note that this birth is also accompanied by the advent of a new generation of coaches. These newcomers, who we have already known from the events of the lower age categories, have no problem with rule changes. They have a great ability to adapt. While maintaining our values, we are able to develop our sport positively. We are happy about that“. The two directors also agreed that technically speaking, the return to force of the groundwork was one of the successes of this 2017 edition: "The new rules allow the referees to give more time to the construction of a dynamic and active judo on the ground. We can see the return of offensive judo on the ground." Mr. Mohammed Meridja, IJF Education and Coaching Director, is always impressed by events held in Georgia. Without a certain emotion, he explained how he started here as an athlete (6 participations, between 1980 and 1987): "It was a real adventure to come here and I think that in the minds of the athletes today, this dimension has not disappeared. "When I came here to participate, I used to arrive from my native Algeria. The tournament used to take place at the beginning of February. From Algiers to Moscow, the shock was huge, as we were leaving a mild weather to -30°C within a few hours of flight. Then we would arrive in Tbilisi and suddenly we would enter another world. "I remember the incredible public, at that time mainly men, all dressed in leather jackets, with their chapka on their heads. The stadium was packed from the morning, but what always marked me was the knowledge of this public, which was able to referee with accuracy at the same time as the referees themselves. "The competition was very strong between the former-Soviet athletes and all we hoped was not to meet one of them in the first round. The Georgians had a very beautiful judo and we could feel that we were, so to speak, in the cradle of Russian judo of the time. Meridja also explained the important role that the IJF plays today in the field of education and coaching: "We currently have two major projects. One in the field of aid to continents and federations so that they can more efficiently structure themselves and achieve greater autonomy and the other so that as soon as possible all coaches who officiate on the verge of tatami have a recognised qualification. For this, the role of the IJF Academy is crucial." Mr. Meridja being also the first vice-president of the African Judo Union, in charge of technical development, explained what will be the next stages of development on the African continent: "A new team is in place under the leadership of President Habib Sissoko. We have already begun to develop skills in the field of katas. The IJF offered us the services of an expert, Mr. Piero Comino, who is touring the countries. We also set up a program so that at least one coach per country can integrate the IJF Academy. And at the next African Championships in Madagascar, we will detect the young talents who will then be able to integrate the IJF training centre based in Hungary. All this in order to prepare our athletes for the Tokyo Games in 2020." After three intense days of competition in the Georgian capital, the international judo circuit is now heading to neighbouring Turkey, as the third Grand Prix of the season will take place from 7 to 9 April in the city of Antalya. Located on the southern coast of Turkey, with more than 12 million tourists annually, Antalya is one of the most frequented seaside resorts in the world and the city already has a long history with the judo, a sport which is very popular . No less than seven clubs share a population of nearly 1,000 judoka in Antalya. A true championship factory on the national level, the city was proud to see one of its 'children' participate in the Rio 2016 Games. If Dilara LOKMANHEKIM (-48kg) now trains in Istanbul, she started judo on the the Mediterranean coast, in the "Turkish Riviera". In 2010, Antalya successfully organised the IJF Team World Championship and every year European events are held in the region. After several years in Samsun on the northern side of Turkey on the Black Sea, the Turkish Grand Prix will now moved southwards and the sunny coast of Antalya, which has the advantage of having high-quality infrastructures in terms of accommodation, transport and, of course, sports equipments. The 'Antalya Arena Spor Salunu' will host for the first time an event of international stature. From the organisers, the watching world, to the attention of judokas all over the world, the message is simple: Come and enjoy the family and friendly atmosphere of Antalya, you will not be disappointed. In the morning, based on the ranking list, both French were expected to be in the final, especially Madeleine MALONGA, who is currently world number 12 and was the top seeded athlete of the category. But the 23 year-old was surprisingly defeated in the semi-final by Anastasiya TURCHYN (UKR). The Ukrainian joined the second French, Same Hawa CAMARA, who qualified against Karen STEVENSON (NED). The first unprepared attacks of CAMARA did not put in danger the tall TURCHYN, who seemed to perfectly control the French fire. CAMARA was then penalised, her attacks being not enough prepared. She was again penalided a little later as she was not active on the tatami. As the end of the bout was approaching, the French was again penalised a third time, giving the victory to Anastasiya TURCHYN. The first bronze medal match saw the 2014 Baku Grand Slam silver medallist, Assunta GALEONE (ITA) facing Karen STEVENSON (NED), who finished third at the 2016 Budapest Grand Prix. Three minutes were necessary to see the first main intervention of the referee as STEVENSON was awarded with a shido for passivity. But this only penalty forced both athletes to enter the golden score. 52 secondes later, GALEONE finally applied a perfectly executed o-soto-otoshi for ippon for a fourth medal on a Grand Prix for the Italian. Probably disappointed by her performance in the semi-final, Madeleine MALONGA (FRA) had one more chance to step on the podium as she was opposed to Karen STEVENSON (NED) in the second bronze medal contest. With a first o-uchi-gari after ten seconds, MALONGA scored a first waza-ari, immediately followed on the floor wth a shime-waza for ippon in 22 seconds. In the women’s heavyweight, Maryna SLUTSKAYA (BLR) stopped the local Elene KEBADZE (GEO) on her way to the final. The public strongly supported her though, after her first two wins on ne-waza (groundwork) during the preliminary rounds, especially against the top seed athlete of the day, Svitlana IAROMKA (UKR). In the final, SLUTSKAYA was opposed to two-time world silver medallist, Maria Suelen ALTHEMAN (BRA), who won her first two rounds by ippon. During the whole final Maria Suelen ALTHEMAN never seemed to be in the position to take the lead. Maryna SLUTSKAYA took the advantage when scoring a first waza-ari with an action-reaction technique and then simply controlled the bout by alternatively moving around and going on the ground to save some precious seconds. 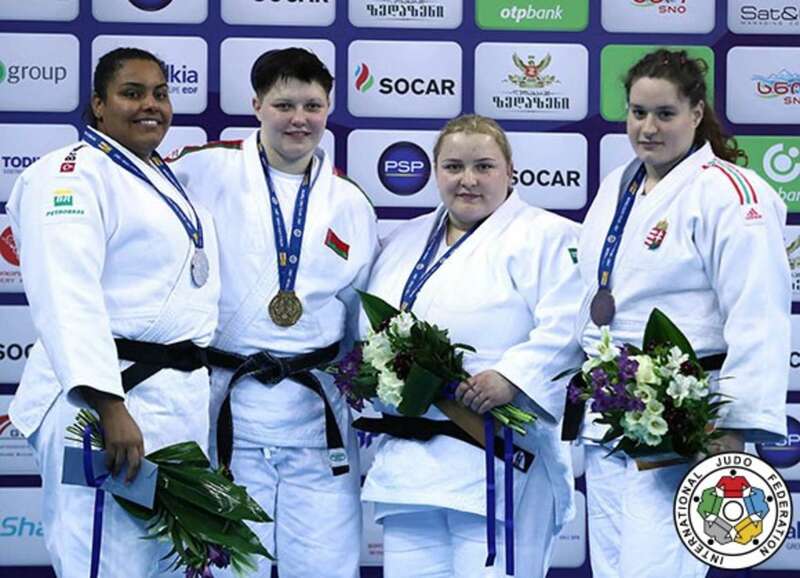 The Belarusian scored again with a drop seoi-nage to confirm her first gold medal at a Grand Prix. The first bronze medal contest opposed Svitlana IAROMKA (UKR) and Santa PAKENYTE (LTU). After almost two minutes of observation, Svitlana IAROMKA being much smaller than her opponent, engaged her leg for a superb o-soto-otoshi and a clear ippon. 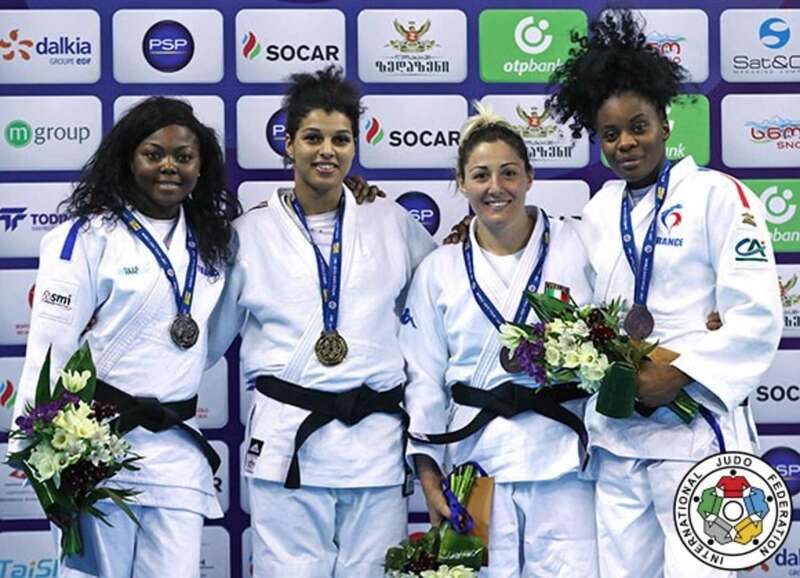 In the second bronze medal contest Mercedesz SZIGETVARI (HUN) had the difficult task to face Elene KEBADZE (GEO) who was competing in front of her public. The Georgian step by step put pressure on the shoulders of her opponent, but when that pressure was transferred onto the elbow of SZIGETVARI in a wake-gatame attempt, which can be dangerous, the jury decided to award a hansokumake to the Georgian, which offered the victory to Mercedesz SZIGETVARI. The men’s -90kg category was dominated by a young generation of Russian athletes as Stanislav RETINSKII (RUS) and Mikhail IGOLNIKOV (RUS) both qualified for the final. RETINSKII defeated top seed Max STEWART (GBR) in the first semi-final and IGOLNIKOV beat VER Gabor (HUN) with a superb ippon. It must be underlined that in this category all athletes represented in the final block were under 25. The final started on a low rhythm as both athletes perfectly know each other. 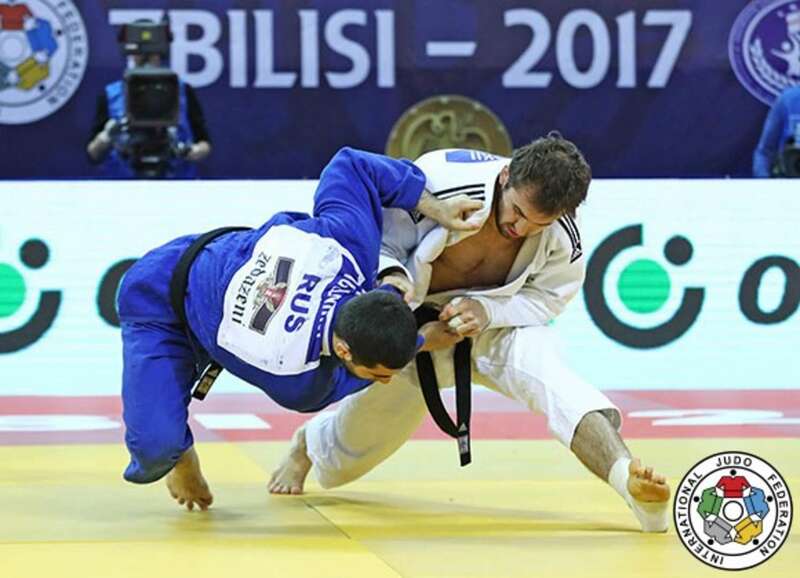 After shidos were distributed equally on both sides, after a groundwork session, Stanislav RETINSKII applied an armlock to IGOLNIKOV for ippon and a first victory on the occasion of Grand Prix. The first bronze medal contest opposed the winner of the 2014 Paris Grand slam, Shakhzodbek SABIROV (UZB) and VER Gabor (HUN). A few seconds were enough for SABIROV to launch a superb uchi-mata for an immediate ippon. Ushangi MARGIANI (GEO) faced Max STEWART (GBR) in the second bronze medal match of the day. STEWART was penalised after a bit more than one minute and a half for blocking his opponent. But being a bit passive, it was then MARGIANI’s turn to be penalised with a first shido, followed by a second one. Only seven seconds were left on the clock when the referee announced the last ‘hajime’ before the golden score. In a last attempt to score, STEWART dropped on his knees for shoulder movement, but lacking of control, he was caught by the subtle counter-attack of MARGIANI for waza-ari exactly on the final gong. With his rough and stable judo, Martin PACEK (SWE) is always a difficult client for all athletes, who know that if they can not quickly score, the rest of the bout will be difficult. Once again, the Swedish confirmed his reputation and entered the final after a difficult semi-final against Jevgenijs BORODAVKO (LAT), who lost by a single shido in the golden score. In the final PACEK was opposed to another young Russian, Kazbek ZANKISHIEV who eliminated the more experienced Rafael BUZACARINI (BRA) in the second half of the draw. PACEK was penalised the first for an unprepared attack, almost immediately followed by a shido for ZANKISHIEV for blocking his opponent. With less than one minute on the clock, PACEK executed a nice tai-otoshi but for no score. Unfortunately he then again applied a too much unprepared sutemi-waza and got penalised again… and again. Three shidos being equivalent to a hansokumake, PACEK was disqualified and Kazbek ZANKISHIEV could win the second gold medal of the day for Russia. In the first bronze medal contest, Zelym KOTSOIEV (AZE), only 18 years old and cadets world silver medallist in 2015, faced Rafael BUZACARINI (BRA), who has already six Grand Prix medals at home. After one minute and a half, KOTSOIEV received a first shido for passivity. The two athletes entered into the last minute with no score. That is the moment, BUZACARINI chose to apply a drop-morote-seoi-nage for waza-ari to take the lead and to keep it until the end for a seventh Grand Prix medal for the Brazilian. 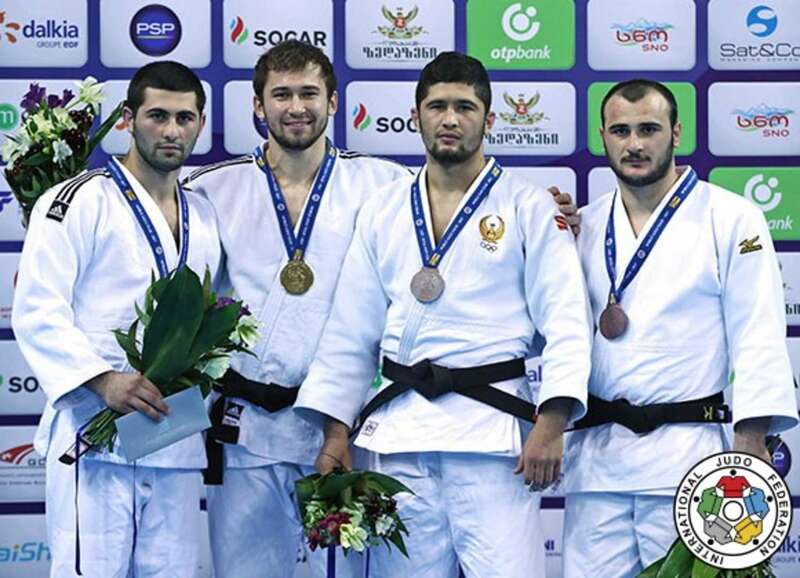 The second bronze medal contest opposed two ‘veterans’ as Soyib KURBONOV (UZB), 29, and Jevgenijs BORODAVKO (LAT), 30 met for a place on the podium. After four minutes, the match continued in golden score as none of the two athletes was capable of scoring during the regular time. 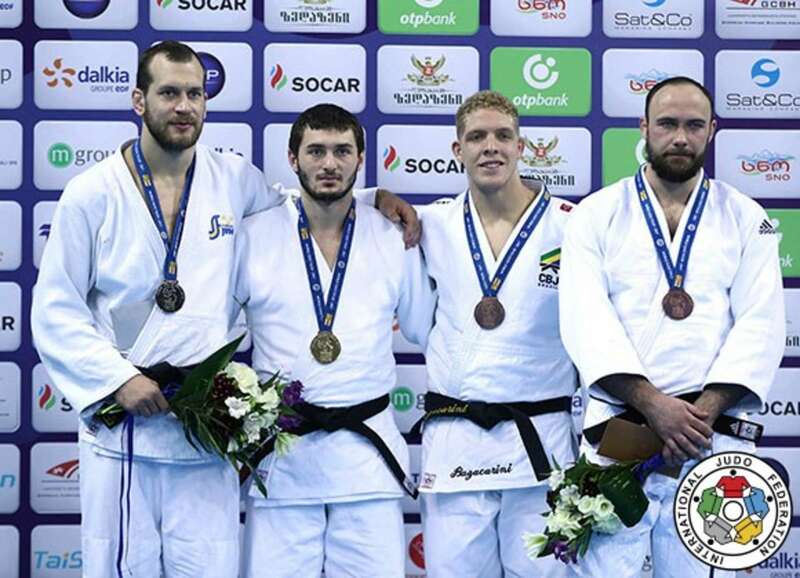 BORODAVKO took his chance to step on the podium with a low-o-uchi-gari for waza-ari. 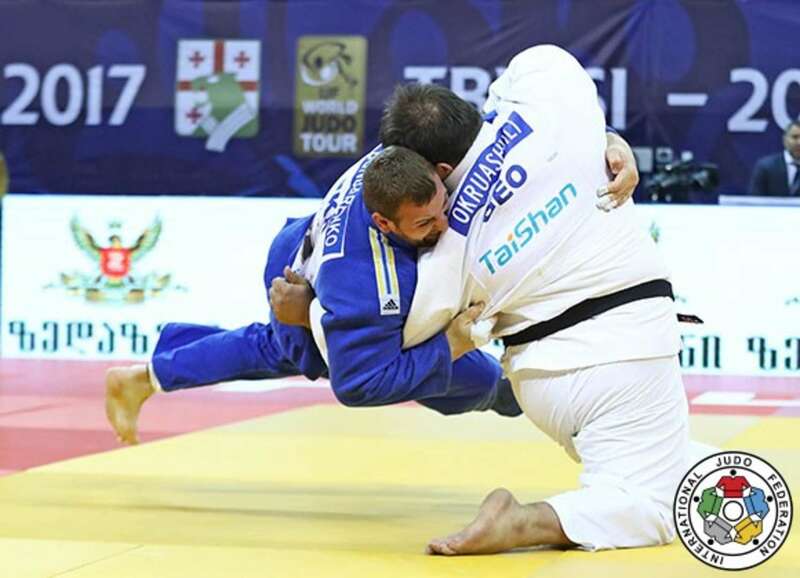 The last final of the day and of the competition sounded like fireworks for the organisers and the public as local hero and Judo World Master in Tyumen 2013, Adam OKRUASHVILI, stepped on the mat. Before that ultimate match, the massive Georgian eliminated David Moura (BRA) in the semi-final. With one waza-ari on his side, the Brazilian seemed to perfectly control the bout, but in judo everything can change until the very last second. OKRUASHVILI, strongly supported by his public did not forget that and caught MOURA with an immobilisation at the very last second. Coming back, the Georgian, even if he was totally exhausted, could have a big smile and get ready for the final. Stanislav BONDARENKO (UKR) was the second athlete qualified for the final after he defeated the second Georgian Levani MATIASHVILI (GEO). After one minute and thirty seconds, BONDARENKO was in danger as he was already penalised two times. Like two titans, BONDARENKO and OKRUASHVILI launched a simultaneous attack. Who would be able to resist to the fantastic pressure? Supported by his public, which came in numbers for this last day of competition and this very last fight, Adam OKRUASHVILI produced a tremendous effort to turn over his opponent only with his arm force for a waza-ari. The public exploded with joy, but a few second later the explosion was even bigger, as the Georgian caught BONDARENKO with an osae-komi-waza for ippon. For the last time of the weekend the Georgian anthem could echo in the New Sports Arena in Tbilisi. 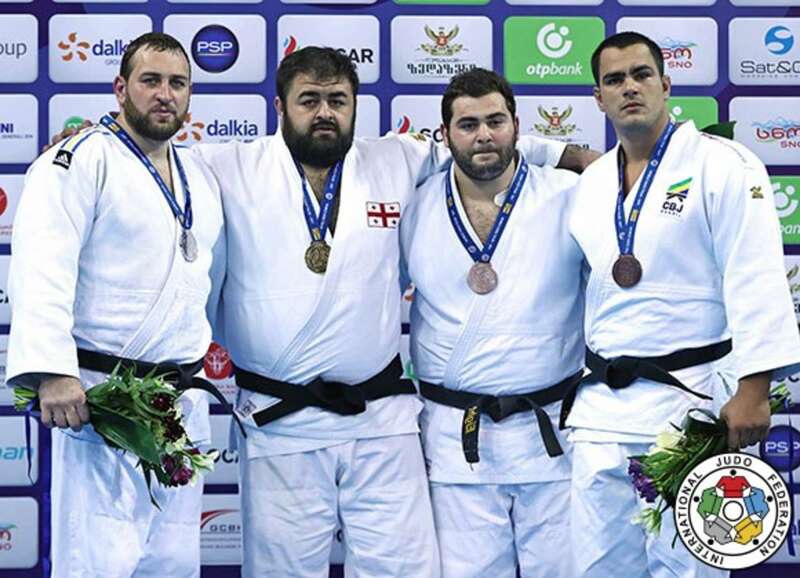 The first bronze medal fight was 100% Georgian as Guga KIBORDZALIDZE faced his teammate Levani MATIASHVILI to guarantee a second medal for the hosts in that men’s heavyweight category on the final day. Levani MATIASHVILI won his eighth medal on a Grand Prix, after KIBORDZALIDZE was disqualified for three successive penalties. The second bronze medal fight opposed Anton BRACHEV (RUS) and David MOURA (BRA). The same scenario applied in this bronze medal contest as Anton BRACHEV was penalised three times for hansokumake. David MOURA could enjoy his 12th medal on the occasion of a World Judo Tour event.